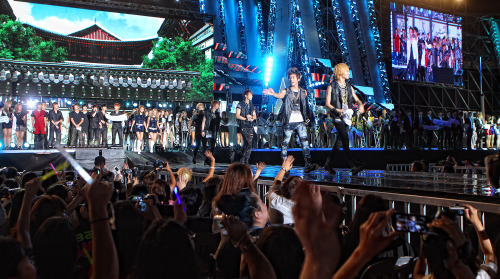 Following Korean pop concerts in June in Paris, the K-pop industry is enjoying a second Korean Wave around the globe. This is the first installment of a two-part series of articles looking at the bright and dark sides of K-pop. ― Ed. Xing Lin, a Harvard University student who visited Seoul for a summer school program at Ewha Womans University, went to an unforgettable Korean pop concert earlier this month in Incheon where 19 groups performed for more than 40,000 cheering fans. The 2011 Korean Music Wave Festival, held at Incheon Munhak Stadium on Aug. 13, was his first K-pop concert. “The concert itself was exhilarating. It was really exciting to be in a stadium full of people who are all enthusiastic about K-pop, which is hard to find in the United States,” Lin told The Korea Herald. He knew all 19 idol groups that performed that night, and the avid JYP fan’s favorite groups were all there. “Even more, because of the concert, I became more interested in a couple of idol groups that I originally had little interest in. The lights, fireworks, and cheering fans really made the experience unforgettable,” he said. Lin was one of about 6,500 international K-pop fans among the 40,000 audience members, according to the Incheon Tourism Organization. 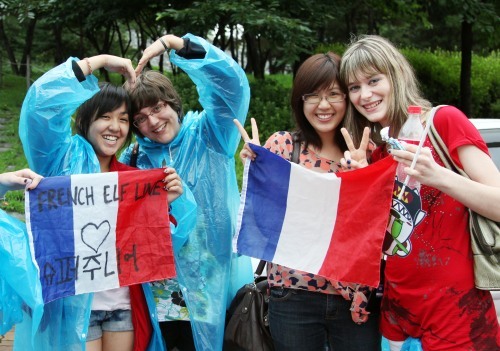 The fans included 3,500 tourists from China and Southeast Asia, 2,200 from Japan and 800 from other countries. The tourism agency estimated that the one-time K-pop concert in Incheon generated 9.1 billion won ($8.4 million) worth of economic revenue, assuming that each foreign tourist spent an average of $1,298 during their stay in Korea. The Korean government sees great potential in attracting overseas tourists on the back of K-pop’s popularity. On Friday, girl group Girls’ Generation was appointed PR ambassador for Visit Korea Year 2010-2012 by the Visit Korea Committee. Earlier in July, boy band Super Junior became the PR ambassador for Korea tourism for the Korea Tourism Organization. A decade ago, Korean teenagers stood in long lines to get free tickets to the KBS weekly music show “Music Bank” featuring their idols. Today, you can hear many different languages from people who have come all the way to Seoul to see their K-pop idols at KBS. The program is a live show but K-pop musicians who make a comeback through the “Music Bank” have their performance recorded. In that case, overseas fans can participate in the show with the help of the artist’s entertainment agency and fan clubs. “When Super Junior had a comeback stage several weeks ago, about 400 overseas fans watched our show,” Kim said. However, the broadcaster is not considering opening up the music program to overseas fans yet, because it could become a marketing tool for travel agencies who might sell the free “Music Bank” tickets as part of tour packages, he said. K-pop’s significance in terms of the export of Korean cultural content has become important in recent years. According to the 2010 content industry report by the Ministry of Culture, Sports and Tourism, Korea’s export of pop music jumped 90 percent from $16.5 million in 2008 to $31.3 million in 2009, while that of games rose 13 percent during the same period. The export of films rose 11.3 percent, while that of broadcast content rose 8 percent, the report showed. By regions, Japan was the largest importer of K-pop content, with K-pop export volume jumping 93 percent to $21.6 million in 2009 from $11.2 million in 2008, according to the report. Among the $31.3 million in K-pop content exported in 2009, 70 percent was sold to Japan, followed by Southeast Asia with 21 percent and China with 8 percent. In Japan, K-pop musicians such as BoA, TVXQ, Girls’ Generation and KARA have been successful not only in holding concert tours but in recording high album sales. Girls’ Generation’s debut album “Girls’ Generation,” released on June 1 in Japan, topped the Oricon Weekly Charts in the first week, the best performance by a foreign artist making a Japanese debut. A veteran K-pop choreographer pointed out that the dance moves of Korean singers play a significant role in the K-pop boom. “Korean artists don’t simply match their movements to make a group dance. They create so-called ‘point dance,’ a hooking, repetitive dance that matches their music. It really distinguishes their performance from others,” said Kim Gyu-sang, head of the DQ Choreography Team, whose list of clients include Rain, Beast, 4Minute, MBLAQ and Sista. “The ‘point dance’ and the related performance are the major medium that conveys the core message of music, which is also a universal language,” he said. One research expert said K-pop is helping to create Korean cultural identity and share it with the world. “They listen to K-pop, purchase the music, make copycat bands, engage in K-pop communities, participate in K-pop contests and imitate fashions of K-pop artists. These activities are itself culture and in this sense, K-pop has a strong cultural influence,” he said.